This application is meant to a be a powerful manager of your mp3 formatted music collection. On first start it asks you for your music directories, starting with system default folders, these locations can be altered later. mp3Manager will scan these folders automatically or by request, adding details about all mp3 files into a database. The main window allows you to list all your files filtered by a variety of fields and ordered in different ways. One of the basic features of mp3Manager is creation and maintenance of lists. Music lists can be used internally in the application, exported to Winamp style playlists or used to physically copy selected files to a given target directory. Music collections can easily become unwieldy in terms of the number of files they contain. Mp3Manager can help users organize their tracks and makes it easier for them to find the ones they want. When first started, Mp3Manager prompts users for a list of folders where their music collection is stored. Then they can begin sorting and managing their songs using the program's built-in filtering functions. MP3s can be filtered by artist, title, album, genre, date last accessed, rating,comments and custom tags. The search can be restricted to a certain folder on the user's hard drive. Filters can also be inverted, or negated by toggling the Not checkbox. This will make the application exclude results which fit the specified criteria. As mentioned before, tracks may be assigned custom tags and a rating of 1 to 5, unrated or ToDel. This can be done by accessing a dedicated window, which also enables one to select the track's genre (eg. Blues, jazz, pop, rock etc) and assign it a short description. Several custom tags can be added to each song and new ones can be created from the same window. The application also provides some other advanced features such as a duplicate finder and an automatic file renamer. The duplicate finder can scan either for identical files or files which share the same artist and title, however, it does not give the user the option to, for example, delete or rename one of the duplicates. 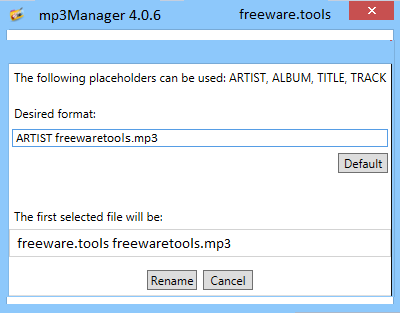 The file renaming feature can extract the song's artist, album, title and track metadata tags in order to automatically rename the actual file. One can specify which of the tags to use, in what order to use them, and it can also remove diacritics. This easy to use software solution can help users tidy up their MP3 collections by offering them a number of handy features such as those mentioned above.